A short holiday a decade ago, and Washington transplant Michael Evans simply decided to stay in Argentina. The co-founder of The Vines of Mendoza, a private vineyard ownership project, counts photography, running and wine-making as his passions. Michael Evans from The Vines of Mendoza. Although he doesn’t place himself in either category, the way his Argentine life has turned out slots him into the latter. A former political campaign manager with a passion for wine, a short holiday a decade ago led to a seamless permanent move and Michael co-founded The Vines of Mendoza, a private vineyard ownership project that now encompasses 500 hectares in Uco Valley. He says: “The first time I came to Argentina was in 2000 for a business trip and I was in Buenos Aires for 36 hours. But I loved it. I had a five-hour lunch at Cabaña Las Lilas, finishing up with Malbec and cigars it was like going back in time. I was working at a telephone start-up at that point, dealing with Telefónica, and then four years later I was working on the John Kerry campaign. Once the election was over, I came to Argentina on vacation for three weeks. “While I was in Buenos Aires, I went to a wine tasting and told the woman running it that I was going to Mendoza and asked her for some suggestions. She said: ‘You have to meet my friend Pablo Giménez, his family has a winery and he’s a great guy, he’ll give you the tips.’” It was the start of a beautiful relationship, both personally and professionally: Pablo Giménez Riili is co-founder of their joint enterprise The Vines of Mendoza. Given that the political campaign had ended at that time and was in between jobs, Michael was essentially free to decide where his life went, and he never returned to the US to live, following that three-week holiday. “I went back in late December to get more stuff but I’ve essentially been living here ever since. I didn’t have any Spanish back then my recollection of those first few weeks was going to a restaurant and ordering something and if I didn’t like it, order something else it was cheap at the time and I slowly learned what the dishes were that way! A move to wine country was certainly attractive from a personal perspective Michael had lived in California and was very familiar with that terroir. He says: “I’ve also been a bit of a wine nut, and when I lived in Los Angeles I used to visit Napa all the time. Then I started to visit other places such as France and Italy I was also very passionate about wine but had never thought about being in the business. Most foreigners who have set up a company in Argentina will never be able to say it was the most simple process thanks to all the unfamiliar red-tape, but Michael says his experience was less complicated given that he went into business with an Argentine. “If I hadn’t met Pablo I wouldn’t have even considered setting up a business here. He’s a lawyer, a home developer, a winemaker, he’s got a lot of talents and that made it a lot easier it ’s certainly not for the faint of heart. I think if we’d realized how difficult things would be at the time, and the hurdles we’d have to go over, we might have done things differently. But that was also part of the adventure at the time. 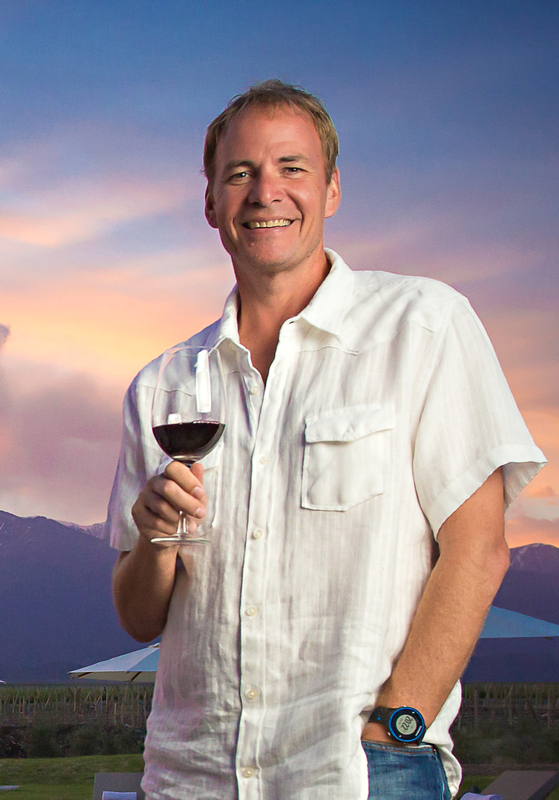 Currently building a house on Vines terroir, Michael mostly resides in the city of Mendoza. “It’s smaller than other cities I’ve lived in and I like big cities, but there are lots of people, great bars and restaurants, it’s quite international in terms of visitors although not so much with respect to expats. I tend to hang out more with locals than with expats, I had 40 years of that in the States! so I really enjoy going up into the mountains with my Argentine friends. “I do a lot of photography in my spare time, so I take a lot of pictures in the mountains. I also started running about a year and half ago I did the New York marathon last November and I plan to do the Buenos Aires one either this year or next. “I’ve also spent a lot of time in Salta, Patagonia and Iguazú. One of the projects I want to do is drive the whole Route 40 over six weeks and take pictures along the way to create a book about the whole drive I think that will be a lot of fun. And it’s a bold statement, but I think I’m the best Yank asador in Argentina I’ve learned a lot from Pablo as well as a trick or two from Francis Mallmann (whose restaurant Siete Fuegos is on site at Vines) and I make a mean matambre de cerdo.